The Volvo 240 chassis is a good hunk of metal let down by a wimpy stock engine, wallowing stock suspension and tires from the Huffy catalog. Start fixing each and every single one of these problems and you will soon have a fast, fun and boxy Volvo...or just buy this one. Save your time and money - buy a completed project from someone who wants out. 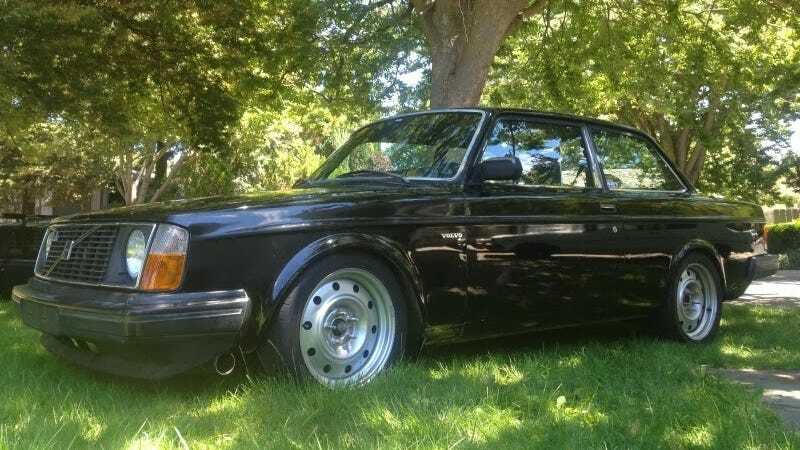 Find this 1983 Volvo 242 with turbo LSX V8 for sale in Modesto, CA for $12,500 via craigslist. The LQ4 V8 is a generation III small block Chevy engine from a truck and is related to the LS1/2/X engine family but has an iron block and weights a few more lbs. A gigantic turbo forces more air into this engine and the car runs E85 ethanol on a MegaSquirt DIY fuel injection system to the tune of 550 wheel-horsepower. Originally posted as 10k: Need More of This: 1983 Volvo 242 Chevy LQ4 V8 Turbo on Daily Turismo.